This formula relates the resistance of a conductor with its specific resistance (the Greek letter "rho" (ρ), which looks similar to a lower-case letter "p"), its length ("l"), and its cross-sectional area ("A"). Notice that with the length variable on the top of the fraction, the resistance value increases as the length increases (analogy: it is more difficult to force liquid through a long pipe than a short one), and decreases as cross-sectional area increases (analogy: liquid flows easier through a fat pipe than through a skinny one). Specific resistance is a constant for the type of conductor material being calculated. Notice that the figures for specific resistance in the above table are given in the very strange unit of "ohms-cmil/ft" (Ω-cmil/ft), This unit indicates what units we are expected to use in the resistance formula (R=ρl/A). In this case, these figures for specific resistance are intended to be used when length is measured in feet and cross-sectional area is measured in circular mils. Algebraically solving for A, we get a value of 116,035 circular mils. Referencing our solid wire size table, we find that "double-ought" (2/0) wire with 133,100 cmils is adequate, whereas the next lower size, "single-ought" (1/0), at 105,500 cmils is too small. Bear in mind that our circuit current is a modest 25 amps. According to our ampacity table for copper wire in free air, 14 gauge wire would have sufficed (as far as not starting a fire is concerned). However, from the standpoint of voltage drop, 14 gauge wire would have been very unacceptable. Our total circuit wire resistance is 2 times 5.651, or 11.301 Ω. Unfortunately, this is far too much resistance to allow 25 amps of current with a source voltage of 230 volts. Even if our load resistance was 0 Ω, our wiring resistance of 11.301 Ω would restrict the circuit current to a mere 20.352 amps! As you can see, a "small" amount of wire resistance can make a big difference in circuit performance, especially in power circuits where the currents are much higher than typically encountered in electronic circuits. Conductor resistance increases with increased length and decreases with increased cross-sectional area, all other factors being equal. Specific resistance for materials are given in units of Ω-cmil/ft or Ω-meters (metric). 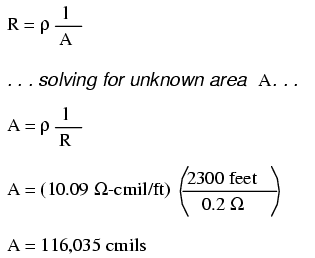 Conversion factor between these two units is 1.66243 x 10-9 Ω-meters per Ω-cmil/ft, or 1.66243 x 10-7 Ω-cm per Ω-cmil/ft. If wiring voltage drop in a circuit is critical, exact resistance calculations for the wires must be made before wire size is chosen.